Black "Leather" Stanchion Rope Naugahyde 1.5" dia. Red "Leather" Stanchion Rope Naugahyde 1.5" dia. 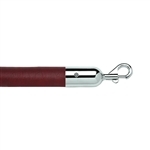 Maroon "Leather" Stanchion Rope Naugahyde 1.5" dia. Dark Blue "Leather" Stanchion Rope Naugahyde 1.5" dia. Dark Green "Leather" Stanchion Rope Naugahyde 1.5" dia. Burgundy "Leather" Stanchion Rope Naugahyde 1.5" dia. Gold "Leather" Stanchion Rope Naugahyde 1.5" dia. Grey "Leather" Stanchion Rope Naugahyde 1.5" dia. White "Leather" Stanchion Rope Naugahyde 1.5" dia. Pink "Leather" Stanchion Rope Naugahyde 1.5" dia.